Home Tags Posts tagged with "Bill and Melinda Gates Foundation"
Approximately 1.5 million children under 5 years-old die each year from vaccine-preventable diseases. One of the strategies of the Bill and Melinda Gated Foundation is to ensure that existing life-saving vaccines are introduced to countries that need them most. The potential issues facing the philanthropic efforts of Bill Gates with the Trump Administration is primarily twofold; the first issue being the nationalistic ideals Trump campaigned for and has acted on, the other is the flirtation with anti-vaccination sentiments he has continuously espoused. President Trump’s inaugural address championed the ideal of looking out for ‘America first’. On the surface that is and should be looked at as an innocuous statement. As a country it is in our best interest to uplift Americans and provide everyone in this country with the opportunity to succeed. The true meaning or intention of Trump’s phrasing can only be revealed by the methods, direction, and policies of the administration. When he says ‘America first,’ does he intend on still preserving the US’s role as an invaluable contributor to those in dire need like the way President George W. Bush did with his aid to Africa during his Presidency? Does he see the US at the forefront of addressing issues on a global scale like President Obama did in pursuing initiatives to prevent climate change? Or when he says ‘America first’ does that mean all of our interests as a country should ignore the global crises that people like Bill Gates have addressed in the past? It’s not known what the ultimate impact of the Trump Administration will have on addressing the global health issues that Bill and Melinda have worked to and helped alleviate. 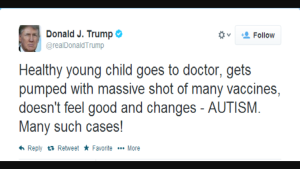 It is not promising when the President tweets out anti-vax and climate change denial rhetoric. It’s even more disconcerting that he’s acting on his dubiousness of vaccines by exploring a panel on the safety of them with vaccination skeptic, Robert Kennedy Jr. Through it all Bill Gates offers an important take away during this podcast despite his efforts being potentially compromised, that it’s still crucial to engage with the President rather than create a wall. Listen to The Economist podcast with Bill Gates here.